With color A, cast on a multiple of 6 sts plus 5 additional sts and knit one row. Row 2 - Right side: With color B, k5, * sl 1 wyif, k5; repeat from * to end. Row 3: With color B, p5, * sl 1 wyib, p5; repeat from * to end. Row 4: With color A, k5, * k1 uls, k5; repeat from * to end. Row 5: With color A, p1, * sl 3 wyib, p3; repeat from * to last 4 sts, sl 3 wyib, p1. Row 6: With color B, k2, * sl 1 wyif, k5; repeat from * to last 3 sts, sl 1 wyif, k2. Row 7: With color B, p2 * sl 1 wyib, p5; repeat from * to last 3 sts, sl 1 wyib, p2. Row 8: With color A, k2, * k1 uls, k5; repeat from * to last 3 sts. k1 uls, k2. K: Knit | P: Purl | Sl: Slip stitch. Wyib: With yarn in back | Wyif: With yarn in front. K1 uls: Knit 1 under loose strand. 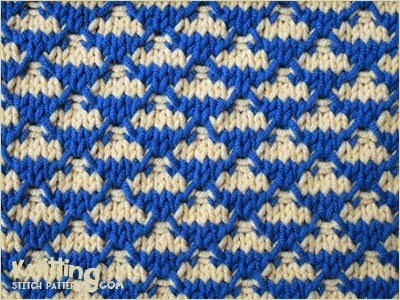 (Insert needle under the loose Color A strand and knit the next stitch).